Music bought from iTunes and stored in iCloud are part of the iTunes Match service, which basically lets you store all your songs and music in iCloud, and can then be streamed and downloaded to your iOS devices. 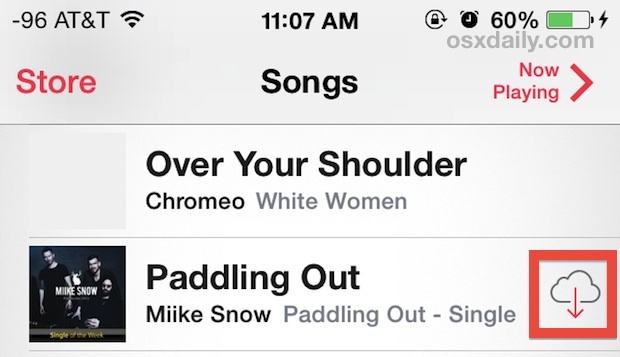 By default, those songs are shown in the iOS app Music playlist with a little cloud icon next to them. Having access to your music from anywhere is an obvious convenience, but a potential annoyance is when iCloud songs show up in your Music library and play and stream alongside local songs, using a devices cellular connection. That default behavior can quickly eat up a lot of a data plan if you’re not cautious, and while you can turn off cellular use for iTunes and Music, another solution is to simply set the Music app so that it does not (or does) display the iTunes Match songs alongside the standard playlists. Knowing the difference between these settings is essential to know whether to keep this setting on or off. If you have no songs purchased from iTunes, no free ‘songs of the week’ downloads, or are not an iTunes Match customer, the setting is largely irrelevant to you, but for those who have a mixture of both locally stored and iTunes bought songs it can be problematic due to the cellular usage. With the setting turned off, the songs with the cloud icon next to them will disappear from the Music app. Adjusting this on a per-device basis can be a good idea. I prefer to only show music on my iPhone that is stored on the device so no cellular bandwidth is accidentally used, but on wi-fi only devices like an iPad or iPod touch there isn’t much reason to turn the setting off. Note this setting has no impact on iTunes Radio streaming, whether from a wi-fi or cellular connection, but toggling it may cause the Radio button to randomly disappear anyway. This has happened a few times in our experience, and though it may be an unrelated bug, it’s easy to remedy and get iTunes Radio back. I’ve been looking for a solution to this for MONTHS. Looking for months? 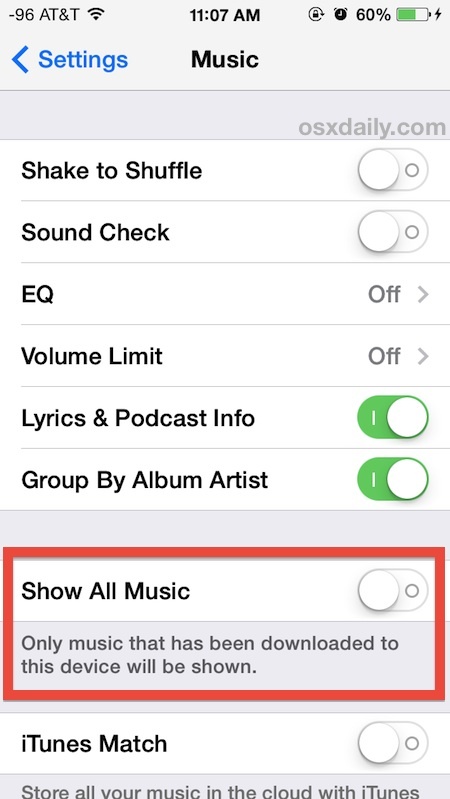 Apparently everywhere except in the music settings… hmm..
How do I get all the settings options?